More shelves and cabinets, I guess I'm in remodeling mode or something. 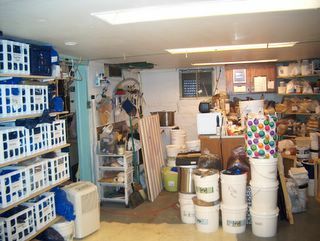 The shelves with crates to the left are my natural dye supplies, ditto for the stuff in front to the right-ish. I'm thinking a rod suspended from the ceiling with shower curtain hooks and some yardage to act as one big moving curtain. Allowing me to hide it so I don't have to be distracted by everything, another issue I struggle with - easily distracted by stuff.